+What to do if the device fails to connect with PanFone iOS Eraser Free? 1.Make sure your iOS is supported. PanFone can support iOS 7.0 and later. 2.Reconnect your device or use another workable USB cable (the originally USB cable is the best if available to use); then close and restart PanFone. 3.Ensure that the latest version of iTunes is installed successfully and it can detect the device. If not, you can go to the link www.apple.com/itunes/ to download and reinstall it. PanFone defines the videos whose sizes are over 5MB on your iPhone as large files. +Why the actual amount of space saved by clearing temporary files is less than the estimated data before clearing? The amount of released space by temporary files clearance is estimated by the used storage on your iPhone when scan your device and the accurate space can only be known after clearance. The estimated figure will be relatively accurate for the first time of using use the program, but after that, it might be not so accurate. +How can I open my large files' backups? 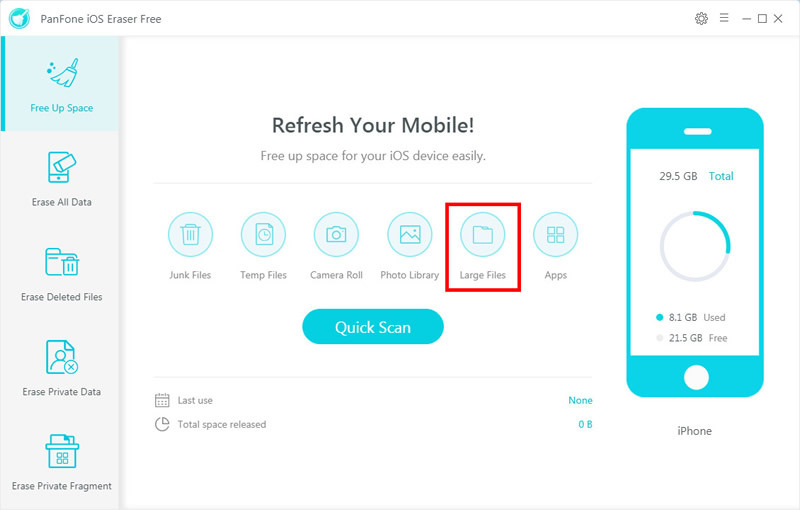 After deleting large files, go back to the Free Up Space interface of PanFone iOS Eraser Free, and click "Large Files" on list, you can find all your large files. +What should I do when the software occur abnormity during clearing temporary files and my available storage space reduce after that?. If the available storage space on your iPhone is large, the software might occur abnormity during the process of clearing. And if the available storage reduce after clearing, you can restart the software and reconnect your iPhone to clear the temporary files one more time. +Why there is update prompt but I cannot click it and update the program? Recently, our website and sever were upgrading for a safer environment and some users got false prompt. We are sorry for the system bug and are working on fix it. To update PanFone, please go to our download page to get the latest version. +Why the cleaning time is so long when using PanFone to clean junk files and temporary files? The cleaning time PanFone takes depends on the junk/temporary files and the storage on your iPhone. Generally, the more junk/temporary files on your iPhone, the longer time it will take, especially when PanFone cleans your iPhone for the first time. +How PanFone clearing up temps files for iOS Device? For iDevices with iOS 8.2 and below version, PanFone can remove temporary files created by both the iOS system itself and the third-party apps. For iDevices with iOS 8.3 and above, PanFone can also remove temporary files created by iOS system itself. But for third-party apps' temporary files, we couldn't remove them directly, we free up this part of space by clearing up trash debris. +Why there are still popups showing after I delete PanFone product and how can I stop that? The popups is from PanFone Helper. And if you want to delete it, you can go to: C:\Program Files(x86)\PanFone to delete the whole PanFone folder and the popups will never show. +Why PanFone can compress your photos? PanFone will apply the almost lossless compression technique – JPEG to compress the photos and reclaim more space on your iOS Devices. "JPEG" is the so-called Joint Photographic Expert Group – the first international standard of image compression. JPEG image compression algorithm does not merely provide good compression performance, but at the same time, has a better reconstruction quality, thus, it makes the lossless compression available. All in all, "JPEG" typically achieves 10:1 compression with little perceptible loss in image quality, which is widely and popularly used in image processing field. In conclusion, by virtue of JPEG technique, PanFone can safely compress your photos to release up to 75% of your photos' capacity for your iDevice. +Will My Original Photos Disappear If Using PanFone? Absolutely not! By default, this program will automatically create backups for your photos on your computer. Therefore, you can still get the original photos back if needed. +What to do if I still encounter an error and can't find out any solutions which show above when using PanFone? If you encounter an error for the first time, please restart the program and try again. If you encounter the error for several times, please submit your problem to our Support Email: support@panfone.com. Offer us your iOS model, iOS version and your PanFone log file. You can find all the logs file from Menu > Open Log File > Logs and send us all the logs in this folder. Please try to submit your case as much detailed and clear as possible to us. PanFone will not ignore any question that submitted to us. We will try our best to solve all technical issues or other problems that you encounter when using our products. Sometimes, we may deal with many questions at one time, so please kindly wait for our reply. We promise that the earliest response will be provided to you!